The images below are by American watercolor artist Carolyn Brady. What do you think? Which is your favorite? i think that the 4th one is the most unique. people seem hard to paint. this is amazing that this is water color, and that they can make it look so real. i wish mine would look like this. These are really cool. I like the first one the best because of how realistic the glass looks. THE LAST ONE! so good! 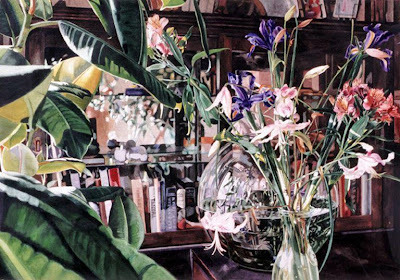 her watercolors look like a actual photograph. that's crazy. I only wish my watercolors could resemble the shape of what I'm trying to paint. These are all so beautiful, her glassware is especially intricate and intriguing. I like her use of bright colors. These look like photos not watercolor! My favorite painting is the one of the food. I like it because it looks yummy and kinda like a slightly blurry picture. My favorite one is the first one because of how realistic the glass looks! My glass in my painting looks nothing like that.. These all look so realistic! I like the last one the best. The paintings look just like a real picture especially the first two and the last one. Incredible how patient the artist must have been do those little details! The first one is my favorite because it looks the most realistic. After trying to paint our watercolors I feel like I have a whole new appreciation for these paintings. 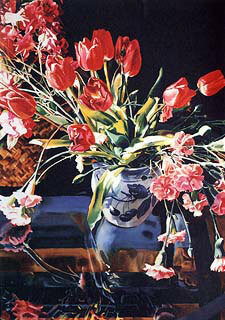 I love the paintings of the flowers because they are so beautiful and colorful!